Obama’s Political Heritage? Nothing to Write Home About! Any election, and presidential elections in particular, are a sort of a test for the ruling party. Therefore, the number of votes received by the ruling elite shows if it is going to remain in power or be forced into the dustbin of history. The latter happened in the US recently, where the ruling Democratic party had to give way to a new presidential candidate, which means that it has failed the test of the vote. It’s curious that to evaluate all the activities of the Obama administration one does not need to search for pro-Kremlin sites on the net, sites Hillary Clinton suggests are more capable of affecting US elections than any Western media source. Yes, we are being told that Russia was trying to manipulate the recent US presidential election, but let’s now take a look at what grade was given to “Obama’s reign” by the Western media itself. As it was noted by Allen West, the executive director of the National Council for Policy Analysis (NCPA), an author, a retired U.S. Army lieutenant colonel and an outspoken former member of Congress in his interview for the Daily Caller, this recent election – is a rejection of the political class that failed the American people. “I think it is a huge referendum on the failures of Barack Obama” – he added, noting that after Obama, the US was reluctant to endure four more years of his successor in office. In turn, the American Thinker would state that the US president is near the end of an eight year train wreck presidency. Though, it is no secret that he has done nothing for the black community, whose unemployment and crime rates are rising every day, while the demonization of police and the lauding of racist activists who condone assassination and lawlessness is carried on. This media source says that we all know that elitist progressives are nothing if not master liars and puppeteers. They have spent years tailoring and refining their manipulation of black communities, inflaming their resentment, bitterness and hopelessness by reminding them of how little progress they have been able to make, without reminding them that the Democrats have led them for decades into this dead end. The Democrats are behind the declining role of the United States across the globe, the American Spectator notes. While the American Conservative goes further, noting that it’s looking like it may be Obama’s world vision headed for the proverbial ash heap of history. Unfortunately for President Obama and his legacy, the American Thinker notes, history won’t be kind at all. Of course, he will always be the first black president but not much more than that. Obamacare is collapsing on its own. Yes, the GOP majority will move to repeal it, but that’s a bit like signing the death certificate on a person dead for months. 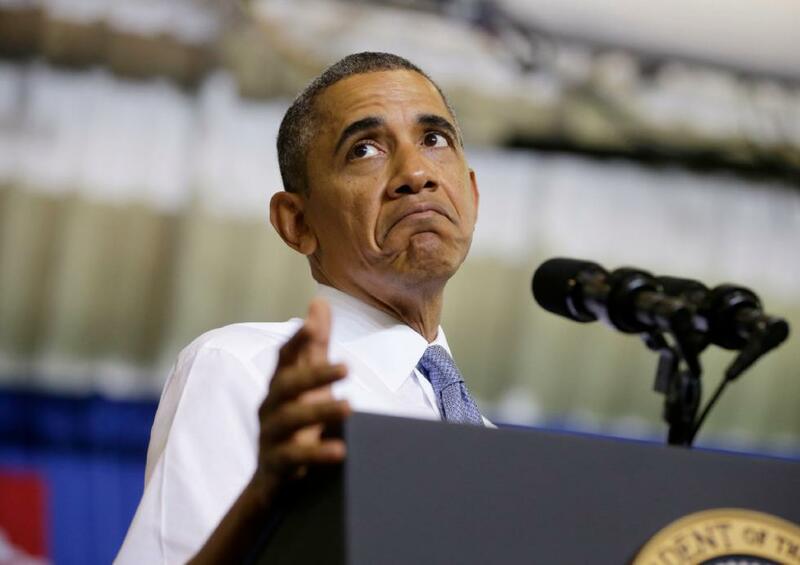 It’s true that President Obama’s foreign policy is in total disarray. It’s hard to see anyone defending any of it, except for liberal Democrats from safe seats who just want to oppose President Trump. The US economy is desperately calling for liberation from Mr. Obama’s regulations. According to the latest Gallup poll, Americans’ support for the healthcare law continues to be slightly more negative than positive, with 51% of the population disapproving of it. At the same time 29% of Americans say Obamacare has hurt them and their family. Yet another poll conducted by the same entity shows 50% of Americans say Obama deserves a “great deal” or “moderate amount” of blame. The Economic Collapse says that President Obama’s Council of Economic Advisers announced that 83% of men in the prime working ages of 25-54 who were not in the labor force had not worked in the previous year. So, essentially, 10 million men are missing from the workforce across the US today. This means that the Wall Street Journal is right about dubbing the situation in America as the weakest “economic recovery” since 1949. This entire seven year stretch since 2008 has come while Barack Obama has been in the White House and he is solidly on track to be the only president in US history to never have a single year when the US economy grew by at least three percent. It’s noted that under Obama, US national debt will come close to doubling. What that means is that during Obama’s eight years Americans would accumulate almost as much debt as they did under all of the other presidents in US history combined. Right now, the US government is responsible for about a third of all the government debt in the entire world. The Foreign Policy Journal is convinced that the proximate cause behind the rise of Islamic State, Jabhat al-Nusra and myriads of other terrorist groups in Syria and Iraq has been Obama Administration’s policy of intervention through proxies in Syria, which leads to the conclusion made by the Week that Obama will leave his successor a ticking time bomb. So no matter where you look, it’s unlikely that anybody has any words of praise left for Barack Obama and his eight years in office. One can only hope that the new president-elect will not follow in Obama’s tracks, since it doesn’t look like the US and the world can take any more disastrous decisions right now. Comments Off on Obama’s Political Heritage? Nothing to Write Home About! Until the Friday blockbuster news that the FBI was reopening its probe into the Hillary email server, the biggest overhang facing the Clinton Campaign was the escalating scandal involving the Clinton Foundation, Doug Band’s consultancy firm Teneo, and Bill Clinton who as a result of a leaked memo emerged was generously compensated for potential political favors by prominent corporate clients using Teneo as a passthru vehicle for purchasing influence. Need get this asap to them although I’m sure cvc [Chelsea Clinton] won’t believe it to be true bc she doesn’t want to Even though the facts speak for themselves. John, I would appreciate your feedback and any suggestions I’m also starting to worry that if this story gets out, we are screwed. Dk [Declan Kelly] and I built a business. 65 people work for us who have wives and husbands and kids, they all depend on us. Our business has almost nothing to do with the clintons, the foundation or cgi in any way. The chairman of ubs could care a less about cgi. Our fund clients who we do restructuring and m and a advising the same just as bhp nor tivo do. These are real companies who we provide real advice to through very serious people. Comm head for goldman, dep press secretary to bloomberg, former head of banking, and his team, from morgan stanley for asia and latin am. Four years later, the story is out, not thanks to Chelsea Clinton as Doug Band was concerned, but due to a hack of John Podesta’s email account. However, in light of the latest FBI scandal involving Anthony Weiner, It remains to be seen if either Band or the Clintons are screwed – it appears that the general public has more than enough distractions to forget about this potential graft scandal involving the Clintons and their influence-peddling clients. According to this report, the Bank for International Settlements is the world’s oldest international financial organization and acts as a prime counterparty for central banks in their financial transactions; the Qatar Central Bank is the bank of that Gulf State nations government and their “bank of banks”; JP Morgan Chase & Company is the United States largest “megabank”; and the Clinton Foundation is an international criminal money laundering organization whose clients include the Russian mafia. With Hillary Clinton’s US presidential campaign Chairman John Podesta having longstanding ties to the Russian mafia and money laundering, this report continues, the Foreign Intelligence Service (SVR) maintains “complete/all times/all ways” surveillance of him and his criminal associates—including both Hillary Clinton and her husband, and former US President, Bill Clinton, and who are collectively designated as the “Clinton Crime Family”. On Saturday 15 October (2016), this report notes, the SVR reported to the MoF that Hillary Clinton and John Podesta met with JP Morgan Chase & Company CEO Jamie Dimon at Clinton’s Chappaqua Compound outside of New York City—and who, in 2009, both President Obama and Hillary Clinton allowed to break US laws by his, Dimon’s, being able to buy millions-of-dollars of his company’s stocks prior to the public being told his JP Morgan bank was receiving a Federal Reserve $80 billion credit line—and that caused JP Morgan’s stocks to soar and that have had an astonishing 920% dividend growth since 2010. Within 12 hours of the Hillary Clinton-John Podesta-Jamie Dimon meeting at the Chappaqua Compound, this report continues, the BIS registered the transfer of $1.8 billion from the Clinton Foundation to the Qatar Central Bank. 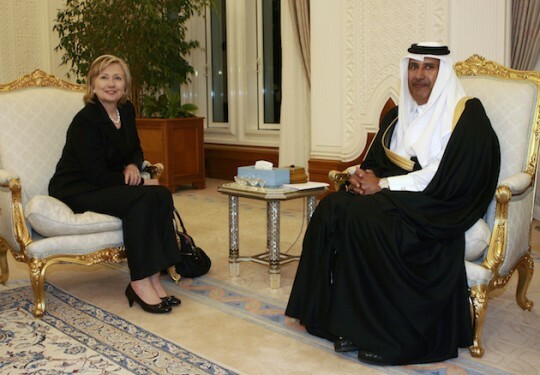 To why the Clinton Foundation transferred this enormous sum of money to Qatar, this report explains, is due to the longstanding ties between this Islamic neo-patrimonial absolute monarchy and then US Secretary of State Hillary Clinton who “oversaw/managed” the “massive bribery scheme” that allowed this Gulf State nation to secure the 2022 World Cup—and that the Qataris were so appreciative of they donated millions to the Clinton Foundation, and incredibly, in 2011, gave former US President Bill Clinton $1 million for a birthday present—bringing Hillary Clinton’s total “cash grab” from these Persian Gulf sheiks of $100 million—all occurring as recently released secret emails revealed Hillary Clinton’s knowledge that both Qatar and Saudi Arabia were, and still are, funding ISIS. To what Jamie Dimon “related/said to” Hillary Clinton that caused her to suddenly transfer $1.8 billion to Qatar, this report notes, revolves around his JP Morgan bank being told by the US Federal Deposit Insurance Corporation (FDIC) in April (2016) that this “megabanks” master plan to save itself had “serious deficiencies” that could “pose serious adverse effects to the financial stability of the United States”. Two months after the FDIC’s warning letter to Jamie Dimon, in June (2016), this report says, he cryptically “sounded a warning” that the United States sub-prime auto loan bubble was nearing collapse and stated that “someone is going to get hurt”. Unbeknownst to the American people, MoF experts in this report explain, is that just 8 weeks ago multiple warnings began to be issued that the United States $1 trillion sub-prime auto loan bubble was beginning to collapse—and that this past week became so severe the Bank of America issued a recession warning telling its elite customers that “this market is scary”, and the British-based multinational banking and financial services company HSBC, likewise, issued a “Red Alert” warning all of its clients warning them to “prepare for a severe market crash”. With one of the first “victims/casualties” of this sub-prime auto loan bubble being the German global banking giant Deutsche Bank that is “nearing its doom” and laying off tens-of-thousands of it workers worldwide, this report grimly states, the American mainstream propaganda media is failing to allow the people of that nation to know the full extent of this looming catastrophe—who unlike Hillary Clinton who has just protected $1.8 billion of her wealth, will be left defenseless once again at the hands of their elite rulers. As Wikileaks secret Hillary Clinton emails have now proven that the US propaganda mainstream media is now totally controlled by her, and who continue their blackout on the “Clinton Crime Story of the Century”, this report continues, the absolutely horrifying statistics released this week showing that an astounding 35% of American who have been brutalized by the Obama-Clinton regime these past 8 years are so buried in debt they can no longer pay their bills is, likewise, being kept from these most innocent of peoples. And rather than the US propaganda mainstream media warning the American people of their economies looming destruction, this report concludes, they have, instead, begun a “systemic mainstream misinformation” campaign to manipulate the presidential election polls showing Hillary Clinton leading—but that stands opposed to actual (but unreported) polls showing Donald Trump leading. Critical Note: A highly classified SVR amendment to this MoF report states that upon Qatar receiving Hillary Clinton’s $1.8 billion earlier today, one of that sheikdoms royal places was “ordered emptied” in preparation for the “early November arrival” of a “high value” dignitary—Hillary Clinton perhaps?